Flexible electrodes with an embedded copper metal mesh for organic solar cells were developed by scientists at the Center for Interface Science: Solar Electric Materials. Solar energy is abundant; however, carbon-based materials to capture that energy efficiently in a solar cell are not as readily available. A new design for a carbon-based, or organic, solar cell offers an exciting solution to this problem by making use of materials that are abundant on Earth while also requiring very little organic material to absorb sunlight. In fact, a 100-nanometer-thick organic layer, 1,000 times thinner than a sheet of paper, will efficiently absorb the sun’s rays. Additionally, these organic solar cells can be fabricated on flexible supports, meaning it might be possible to print solar cells onto different materials. Currently, carbon-based solar cells, known as organic photovoltaics, are often made using indium-tin-oxide electrodes. While the technology of such cells is well established, the indium compound has significant drawbacks. It is brittle, limiting the overall cell flexibility and potential applications. It is also expensive, reducing the economic competitiveness of the cells. Furthermore, there is a very limited worldwide supply of indium. So is it possible to work around these drawbacks to capitalize on the high efficiency of organic solar cells? Researchers at the Center for Interface Science: Solar Electric Materials think so. Bernard Kippelen and his team have developed a new type of organic solar cell that eliminates the need for brittle and expensive indium-tin-oxide electrodes without sacrificing efficiency. To conduct electricity, organic solar cells require a transparent electrode (such as indium-tin-oxide) that allows sunlight to pass into the organic layer. To circumnavigate this, Kippelen’s team embedded a thin, copper-based mesh into a plastic base layer and then deposited a conducting polymer layer and organic semiconductor layers on top of the plastic. The embedded grid with the conducting polymer overcoat replaces the indium-tin-oxide electrode, but because the grid is embedded in the substrate it does not get in the way during the subsequent deposition of the thin organic layers. There are many benefits of this design. In addition to eliminating brittle indium-based electrodes and their economic challenges, this electrode design with an embedded metal grid allows for reduction of the resistive power losses. The high conductivity of the copper used for the metal mesh improves the overall efficiency of the cell. 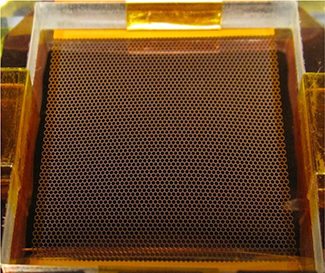 In addition to being more scalable than indium-tin-oxide cells, the new design is flexible, allowing for numerous potential applications. Because they are so thin, flexible, and semitransparent, these devices could ultimately be applied to windows, absorbing only some of the sunlight and using it to power the building. Kippelen notes this is just the beginning for these devices. “It’s not ready for prime time,” he cautions, “but this is sufficiently interesting and intriguing that it has a lot of potential.” He and his team plan to probe that potential in the coming years with funding in part from the Office of Naval Research, pushing these materials further, improving their efficiency, and ultimately providing a reliable source of solar energy to address our growing renewable energy needs. This research was funded in part through the Center for Interface Science: Solar Electric Materials, an Energy Frontier Research Center funded from 2009 to 2014 by the U.S. Department of Energy, Office of Science, Office of Basic Energy Sciences. Corinne Dorais is a Ph.D. student at the University of Notre Dame working under Amy Hixon and Antonio Simonetti. She is involved in the Materials Science of Actinides (MSA) Center, which seeks to understand and control at the nanoscale radioactive materials involved in the nuclear fuel cycle. She obtained her undergraduate degree from Juniata College. Solar panels, used by homeowners and utilities, typically rely on a mix of sunlight and silicon to create electricity. The ultrapure silicon wafers in the panels can be problematic. Carbon-based panels are an alternative, but these use indium, which is costly, brittle, and rare. Scientists eliminated the indium by redesigning the cell to use a thin, copper-based mesh. The new cell is more efficient than indium-based designs and can be rolled onto different surfaces. One day, this design could change how the nation generates electricity. The work was done by the Center for Interface Science: Solar Electric Materials, an Energy Frontier Research Center led by the University of Arizona from 2009 to 2014.